Following up on our last post regarding air pollution in China, I’ve brought it closer to home and given you some articles to read on air pollution in Johannesburg. Again, please follow the links to read the full or original articles. “In South Africa, air pollution is more severe in urban areas, and the city of Johannesburg is no exception. For the complete article, follow the link above. “As more and more people flock to cities, the threat of environmental pollution and its associated health risks grow — conjuring images of swarms of people in pollution masks. Compounding this is the growth in “dirty” industry and urban sprawl that brings people in closer contact with factories, mines and manufacturing plants — and the pollution they produce. But technology presents city management with a new tool to measure and even combat this. One such project is playing out on the streets of Johannesburg. Exposure to air pollution is a risk factor in respiratory complaints, heart disease, stroke and cancer. The World Health Organisation (WHO) calls it the world’s single biggest environmental health risk, and in 2012 attributed around 7m deaths to its effects — with the majority of these in low-and middle-income countries. The World Bank estimates air pollution kills around 20,000 people annually in SA, and puts the cost to the economy, through factors like health-care costs and lost productivity, at R300m. SA has standards in place to try to curb this. Gauteng subscribes to a provincial air quality control management plan — drawn from the National Environmental Management: Air Quality Act — that prescribes limits to things like particulate matter and the levels of certain compounds and elements, including sulphur dioxide, ozone, lead and carbon monoxide, in the air. But measuring these, and potentially identifying and punishing transgressors, remains a challenge. Here the power of the Internet of Things and big data gives us the kind of insight that city governments and regulators could previously only dream of. That’s the crux of a Joburg air quality project being run by the City of Johannesburg and IBM Research. At the IBM Research lab in the Tshimologong precinct in Braamfontein, Tapiwa Chiwewe is using machine learning and analytics to measure several air quality factors, forecast potential poor air quality events, and even use “reverse-forecasting” to pinpoint culprits not sticking to the standards. The lab was established in 2016, as IBM’s second research facility on the continent. Chiwewe is its manager for advanced and applied artificial intelligence. The idea first sparked for Chiwewe on his daily commute into town from Pretoria, when he noticed the haze hanging over the city. From there they reached out to the city authorities, who Chiwewe describes as progressive in their thinking about the issue. 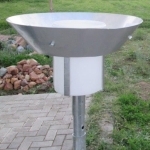 They struck an agreement to draw pollutant monitoring data from six air quality monitoring stations around Johannesburg, as well as historical data from the city dating back to 2004, and further data from the Vaal Triangle and City of Tshwane monitoring stations. The stations also monitor other parameters, such as weather conditions. Unlike some big data applications, a key element here is not the size (in terabytes, for example) of data being crunched, but the rate, says Chiwewe. Each of the stations is taking multiple readings an hour (some every 10 minutes) and these feed back to IBM and are processed for near real-time insight. City of Johannesburg spokesman Nthatisi Modingoane says the analytics and forecasting strengthen the city’s air quality management strategies. Among other things it enables an early-warning system and tracks the effectiveness of intervention strategies. “In future it will change the way air-quality information is communicated to the public,” he says. “Air quality data is meaningful only if it’s easily interpreted and readily available. It is at this level that it changes the lives of people, as forecasting can enable members of communities that are sensitive to poor air quality to [choose] whether to expose themselves or not,” he says. In exchange for data access, the city gets access to a platform IBM developed that stores and crunches the data. This can produce an air quality index and alerts, and show location and temporal trends in air pollution that can be mapped onto the city, and could potentially be a tool to check actual emissions against the values on an emissions licence. It also feeds into city and developmental planning. This transforms the monitoring from a manual process — using spreadsheets and pivot tables — to one showing real-time data visualisations. The platform is not public, but it has the potential to feed into public-facing applications, such as websites or apps that could colour-code the air quality status to be less scientific and more user-friendly, or issue alerts for certain areas if they anticipate an “adverse pollution event”. Please follow the link to the original article to read it in full.